6102 700 to 2200 nm??? There are 4 different slit widths. and the widest for the most light to the photodiode. in rotation when the wide slie is used. 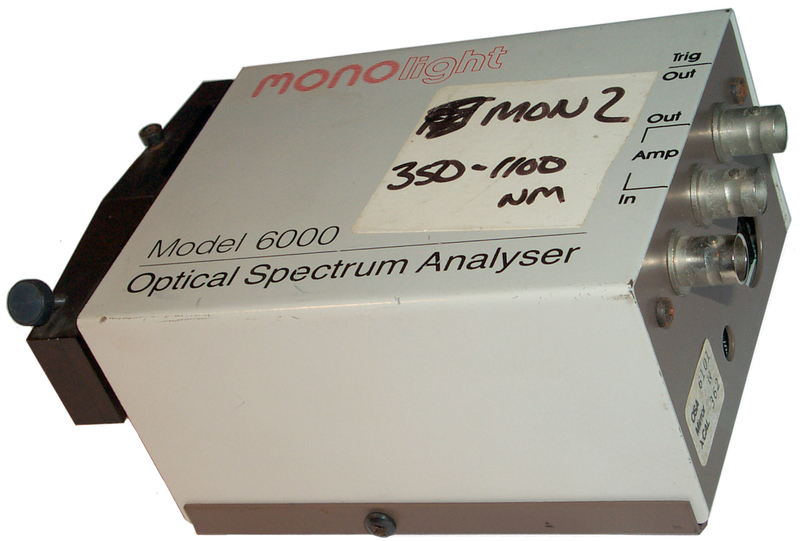 I'd like to be able to measure the spectrum from LED and found these Monolight Optical Spectrum Analyzers on eBay. They use an optical grating that's rotating to scan a spectrum. 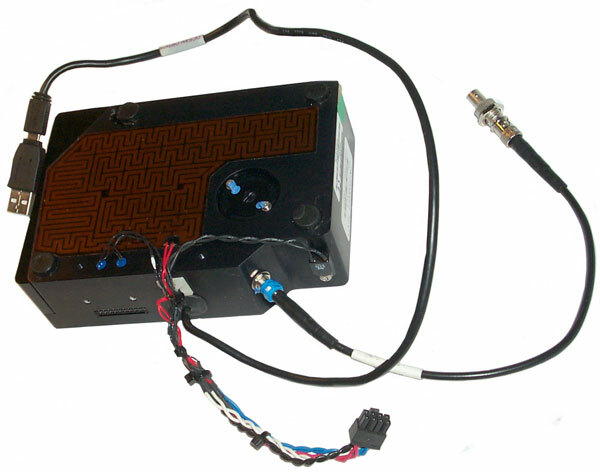 A scope, analyzer box or custom PIC micro controller can read the brightenss on the diode as a function of the time since the motor trigger (index) pulse. 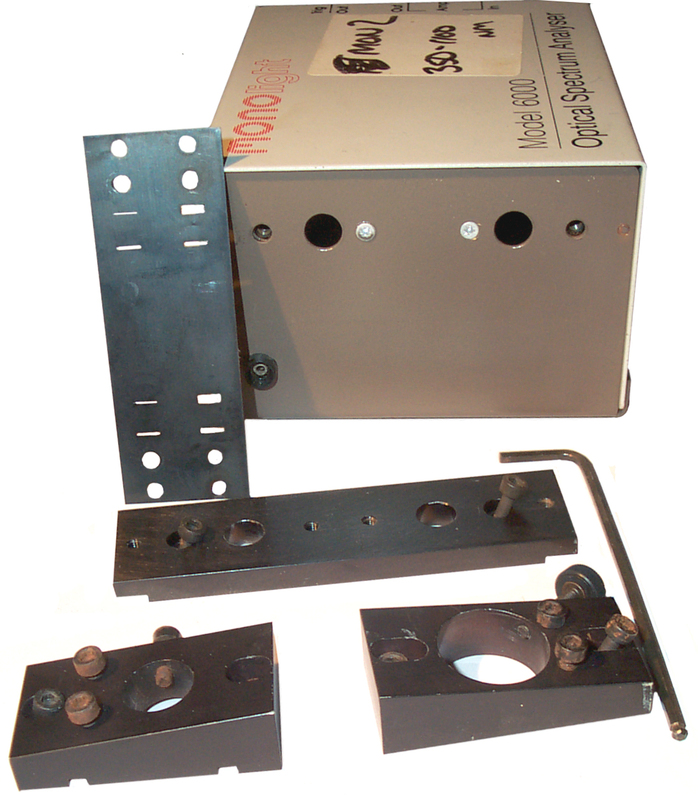 For more on how they work see the Wiki article on the Monochromator. For a lot more technical deepth see The Optics of Spectroscopy - A TUTORIAL on the Horiba Jobin Yvon website (they make gratings). Historically spectral analysis is the basis of a great part of modern physics. For more see the References paragraph on my Fire web page. 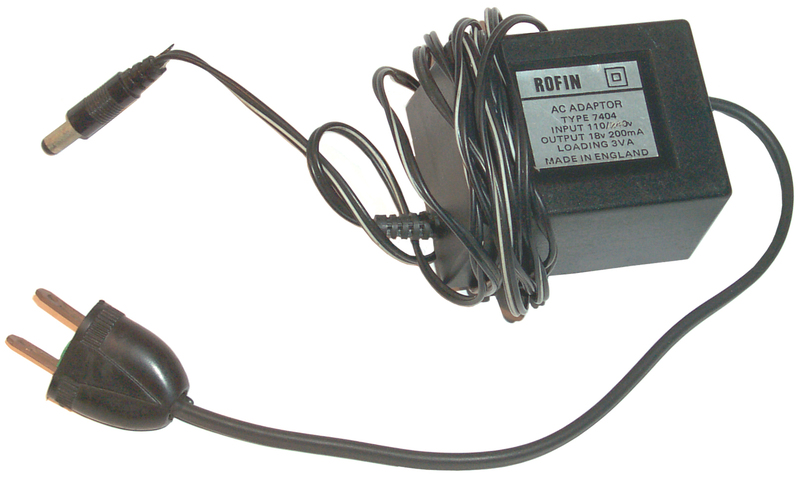 Rofin seems to be a high power laser maker and no longer offers this product. Macam Photometrics is still in business and offers a number of optical products, although their web page for the Monolight is sparse. I hope they have manuals for these. 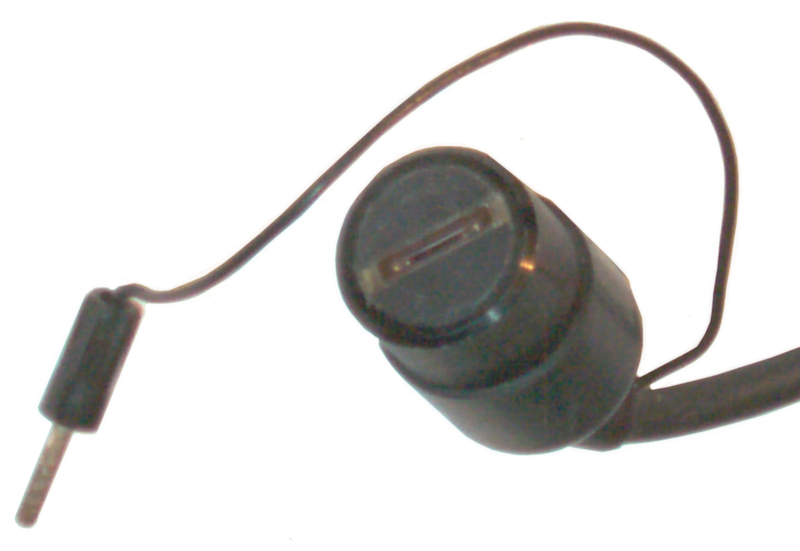 The optical assembly is wrapped in black plastic to minimize stray light. There is some relation between the grating lines/mm (1200 or 600) and the spectrum that can be displayed at the first order. A low or high pass filter may be needed at the input to limit the wavelength entering the OSA so that the harmonics do not show up. The second grating number may be the "blasé" (500 or 1000) and is the wavelength where the performance is best, so for the 6101 it would be optimized for visible light and the 6102 for near IR light. 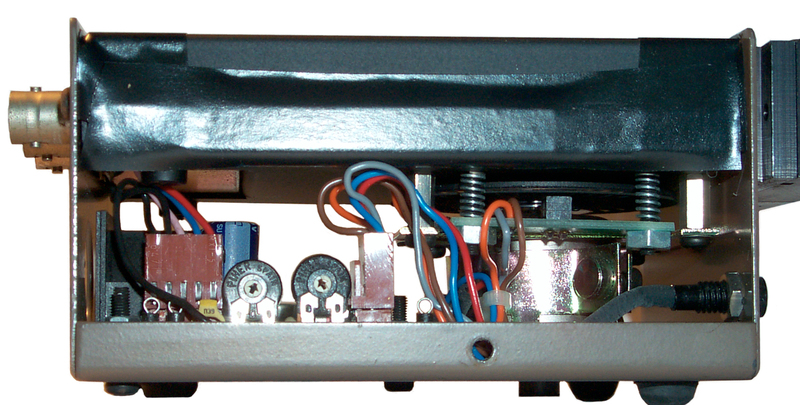 Considering the short length of the cables on the photo diodes and the labels AMP In and Out, it's likely that photo diode gets connected to the Amp In BNC jack. The holes in the optical assembly are different diameters for the 6101 and 6102 with the 6102 having the larger hole. The photo diodes are also different diameters so they are shown above in the correct column. The input block and seperate output block of the optical assembly can be moved about 1/4 inch which may be for calibration or peaking of the response. 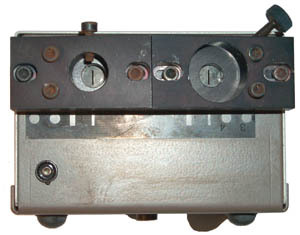 There is a metal template on the optical assembly with different slit sizes. The function of the 7 socket DIN connector is a mystery. 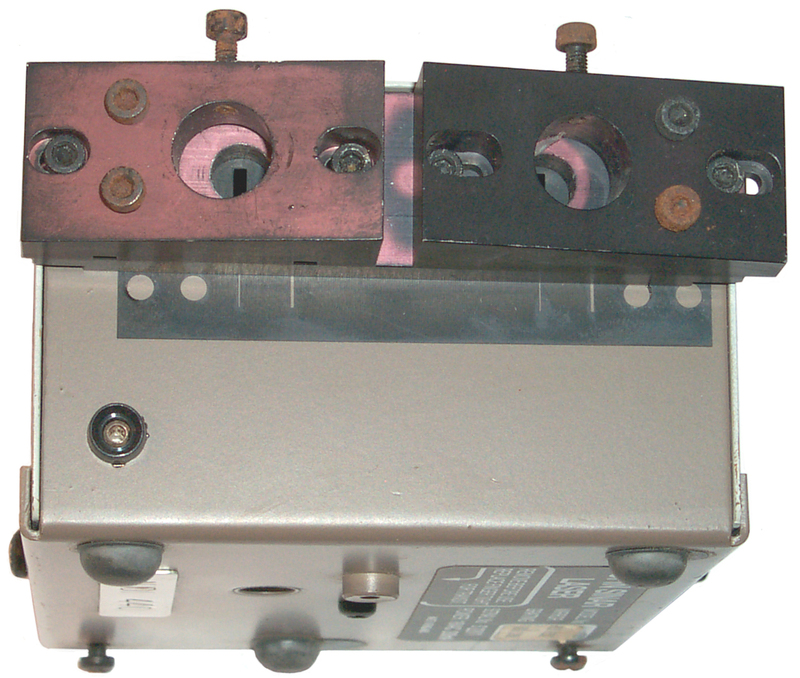 Both OSAs are marked as using 18 VAC @ 200 ma and that's what the label on the wall wart Power Cube says. When the power connector is connected with you ear on the box you can just hear the motor running. The Trig Out has a pulse about 3 ms wide with a period very close to 100 ms. Triggering a scope from that pulse and then looking at the Amp Out sometimes shows a repeated pattern when a bright LED flashlight is shined into the input slit. Maybe an optic is needed to focus the input light on the slit? W's Laser-Projects page ! 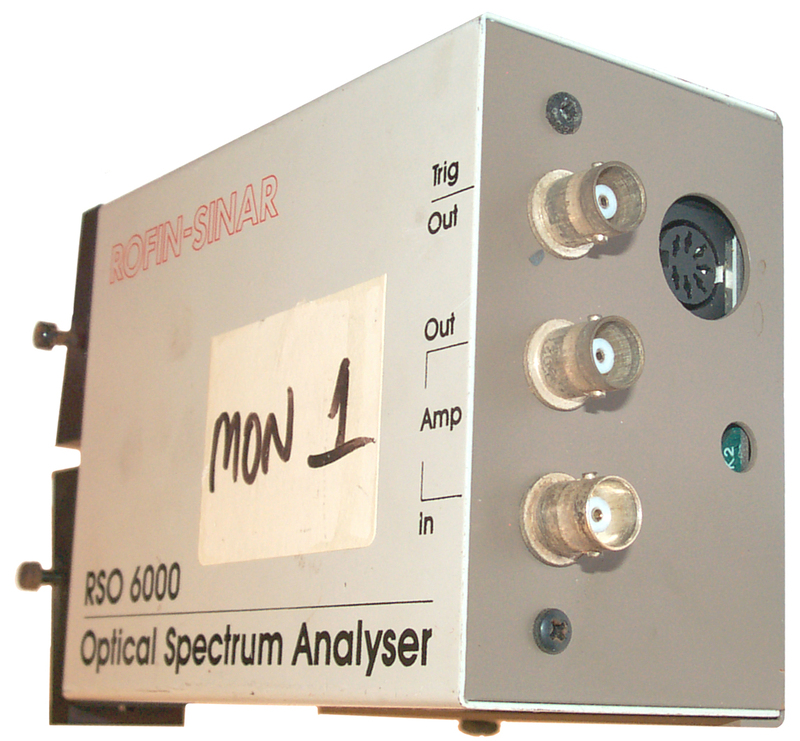 - Rofin-Sinar RSO 6000 Scanning Monochromator/Optical Spectrum Analyzer - a web page by someone interested in lasers. 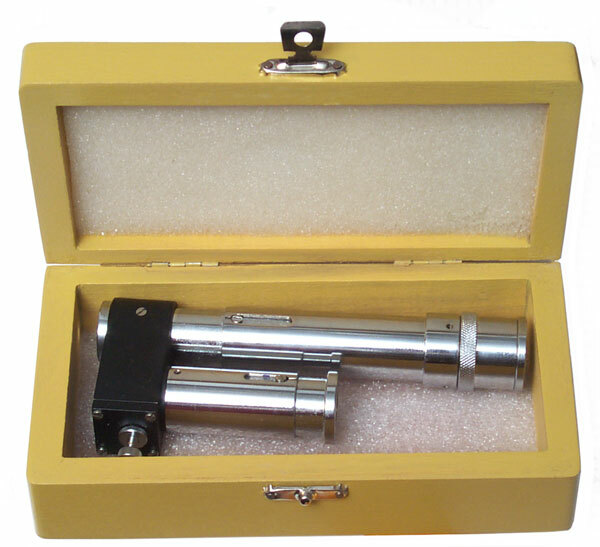 Has photos of inside of the optical assembly with green laser light beam. There's a notch in the metal side wall that appears to be there to allow light to escape from the OSA and maybe go somewhere else? 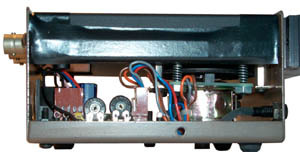 Also shown is an EG&G Gamma Scientific 6200 Control box connected to the 6000 series OSA. It seems to work. For each filter position you can adjust the pot to get a zero center reading on the meter. Using a different light source, like different LEDs gives very different pot readings. Although the pots are dirty and need a squirt of cleaner. Got this for almost nothing on eBay, maybe because of the missing color dots on the pots or maybe because film is becoming obsolete for many applications. If you know of a free manual tell me where to get it. 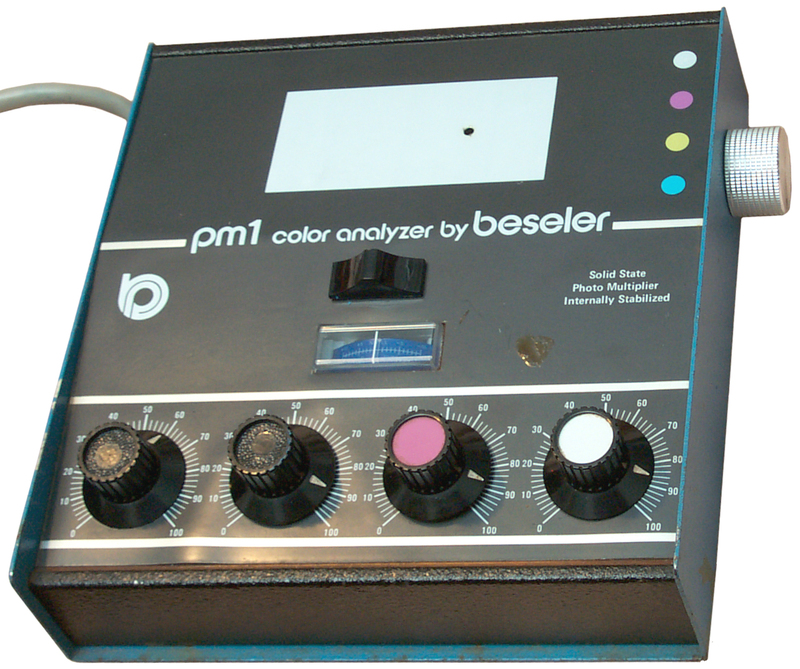 The manuals I've seen for sale cost many times what I paid for the analyzer. Hole in white field is input to PMT. 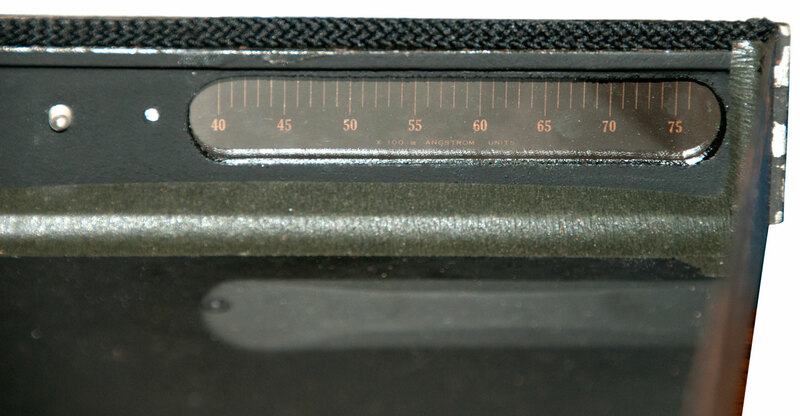 color filter and which channel meter reads. The eyepiece is shown at the left. The short tube on the right contains the wavelength scale which is focused by sliding the tube in and out. The longer tube contains the grating which is focused by sliding it in and out. The knurled ring on the long tube can be turned over a small range to control the brightenss of the incoming light. 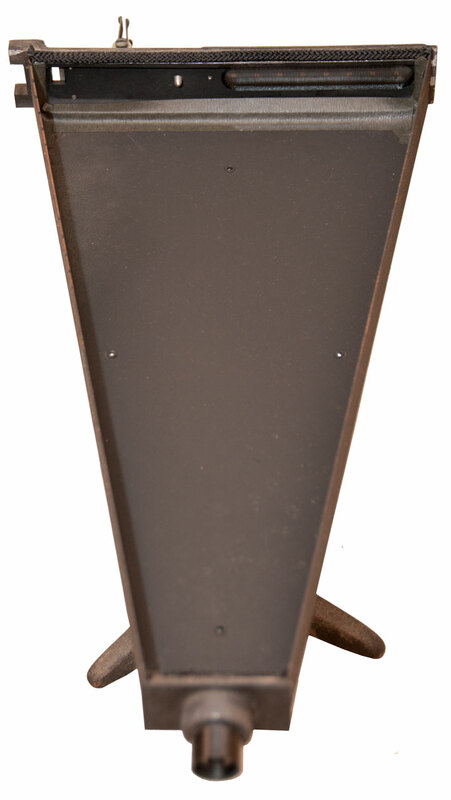 The knurled screw and lock nut adjust the scale display relative to the spectrum display. Note the spectrum scale shows 750 (nm) on the left and 400 (nm) on the right. Between the lines for 575 and 600 is a longer line marked "D" for the Sodium "D" line (Wiki: Na) used to adjust the scale position. First focus the scale and spectroscope tubes by looking at something that has a line spectrum like a computer monitor (not a hot body that has a broad spectrum where there are no lines to focus on). The focus needs to be done first since changing the spectroscope focus moves the spectrum it generates. Some table salt (NaCl) on aluminum foil produces a line at 589 nm. Note the Al foil will melt in the stove's gas flame bringing salt into the flame. and turning the knurled ring to dim the line allows the cal screw to be set and the nut tightened bringing the yellow line onto the "D" reference line. 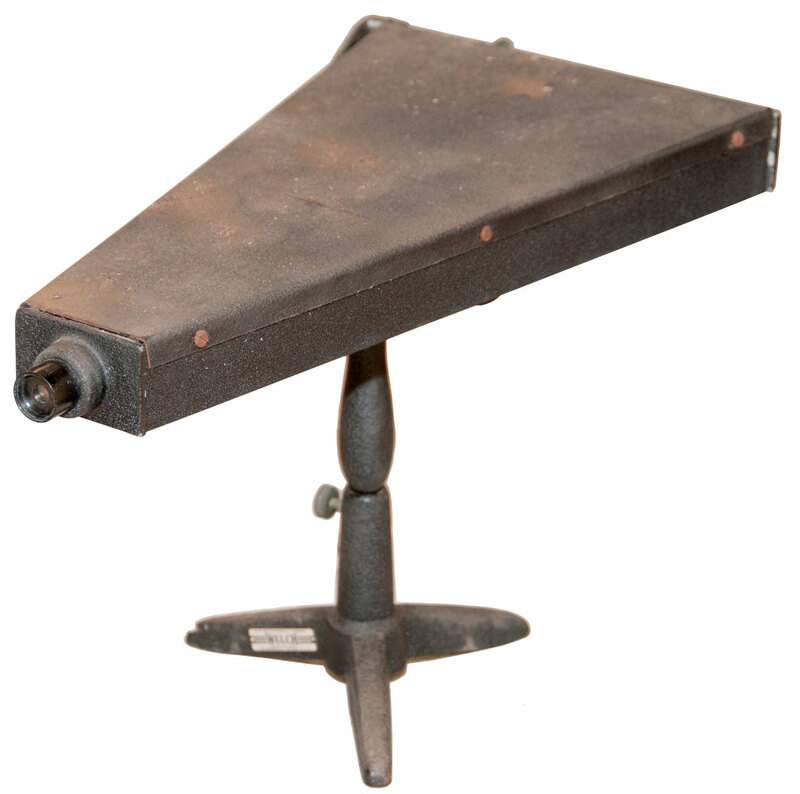 The spectroscope is held with the long tube to the right (causes the wavelength scale numbers to be right side up). For me taking off my reading glasses allows better focus of both the scale and spectrum by extending or retracting the two front tubes. This is a computer display from a USB interfaced hand sized device. The software is about 50 M Bytes. 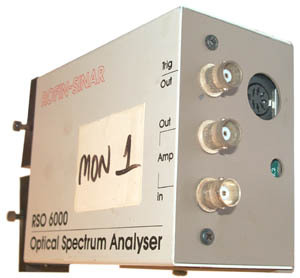 When run on a laptop the system becomes a portable Optical Spectrum Analyzer. It coverts 467 nm to 670 nm i.e. uses the H9 grating. The plot below was taken on the CF-28 Toughbook in the TV room, and printed as a pdf file to the local folder on my desktop computer. Acrobat Pro 9 exported a .tiff version of the .pdf which Photoshop 7 made into a web .jpg and here is is at about 1/5 actual size. I think the sharp drop at the right is the glass cutting off the UV lamp output. Do you know what's making the spike at 434 nm? Answer: A fluorescent light may be the cause of the spike at the low end of the scale. Since this is the first version (no letter suffix) the max count is a little over 4000. If the integration time is too short then the plot is a flat line at the dark current. If the integration time is too long the plot flat tops at the top of the plot. Uning the averaging function has the potential to reduce the noise, but not to give you more counts. Ocean Optics has both complete PC application software as well as drivers for various flavors of "C" as well as a LabVIEW driver (OmniDriver). 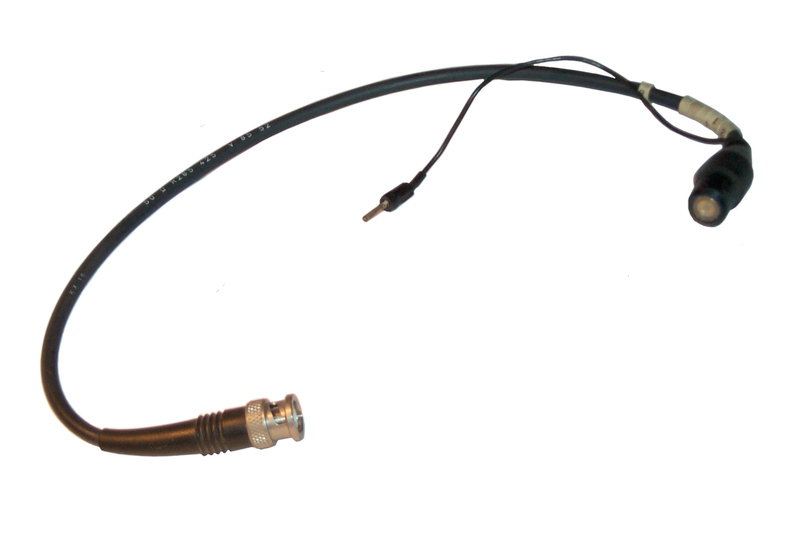 There are interfaces for SMA 901 Fiber Optic input; USB 1.1; 2x10 header with: RS-232, Serial Clock and Data (micro Controller) as well as trigger inputs and outputs. Seem to be near IR OSAs. The Model 20 uses an analog meter and the 20D uses LED digital displays for both wavelength and transmission or absorbance. Yellow board/plastic? 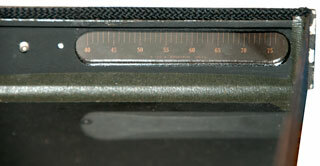 - film scale, glass plate. Looks empty, but . . .
left half of slit mechanism removed to get cover off. Scale from 40 to 75 x100 Angstrom Units( 4,000 to 7,000 angstroms). 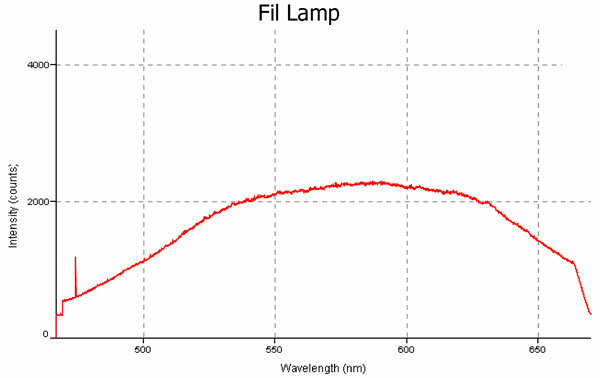 EFI Spectrophotometer patents "X-Rite" "i1"
It may be possible to use the Datacolor Spyder4 to measure flashlights. 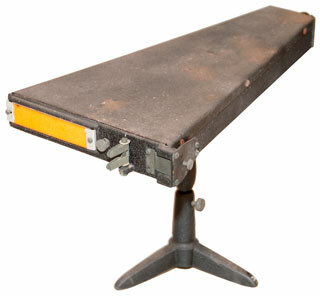 6590648 Apparatus for measuring light, Adrian von Orelli, Peter Ehbets, 2003-07-08 - "for measuring light that is emitted, remitted, or transmitted from a measuring object." ASEQ Instruments - sells a couple of OSAs for reasonable prices as well as accessories. 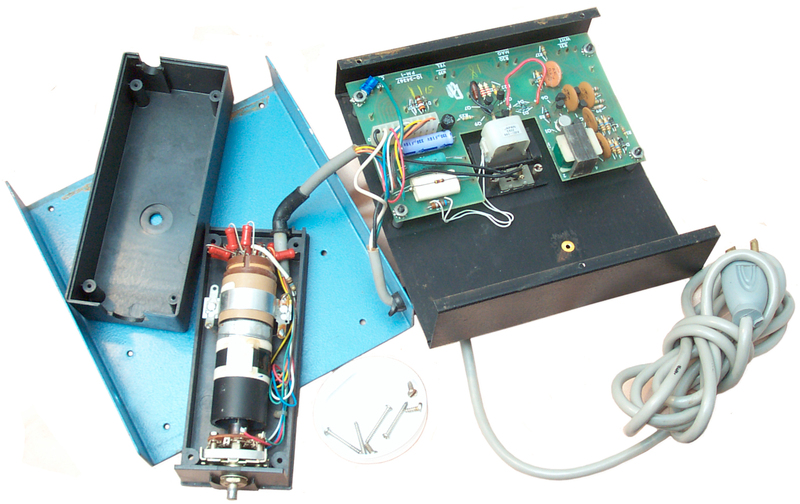 Surplus Shed - Wollensak spectrometers, both with and without the wavelength scale. [an error occurred while processing this directive] page created 22 Dec 2007.